Eli is the platform for Italian vocalist Eliza Pezzuto. She was discovered on MySpace by Lion Music chief Lars Eric Mattsson. He basically created this album to showcase her beautiful voice. Yet there is more to Pezzuto than her mesmerizing vocals: she also plays piano and celtic harp. And her vocal resume goes beyond rock and metal to include gospel, baroque and opera. Essentially then, 'Darkness Will Fall' was created to showcase her immense vocal talents. Generally, this disc displays Pezzuto's efforts quite well with no thanks to the rather bland and derivative symphonic and gothic rock. Though there are some pleasing moments in the first four songs, nearly the whole first half is made of generic gothic rock (with a few instances of quirky keyboards). Sometimes, the instrumentation gets the best of the arrangement and, though not intentionally, overshadows Ms. Pezzuto as on 'To Slowly Fade Away' and 'Welcome To My Dream.' The latter has a brief, but impressive, guitar solo by Mattsson towards the end. If you can get through this rather mundane beginning, you will be reward in the next three songs. While 'For Mother Earth' is grounded in symphonic rock, it is better number simply because it is brighter, more like melodic metal, than the preceding and the lyrical content seems to inspire more emotion from Pezzuto. It's probably the best track on the whole work, and my favorite. A very close second is the following 'Leave Me Here,' a vibrant melodic metal piece where Ms. Pezzuto is stretched beyond typical female goth vocals to a more metal style. This song is also a true representation of Mattsson's significant composition and guitar skills. The final charm is 'My Emptiness' as Pezzuto defines simple strength and beauty as she sings over an acoustic guitar foundation, a marvelous piece. From here you can probably turn off your CD player for it's merely a return to average goth rock. Without doubt, Eliza Pezzuto is an amazing vocalist with strength, range and beauty. Unfortunately, 'Darkness Will Fall' is not quite the showcase it could be for her as it is largely filled with average goth rock and metal. But, then again, competition is tough in this genre. It's hard to do something truly novel and compelling no matter how good your vocalist is. Recommended for the shear delight and beauty of Pezzuto's voice. Without doubt, Eliza Pezzuto is an amazing vocalist with strength, range and beauty. 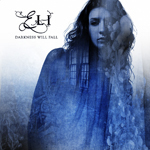 Unfortunately, 'Darkness Will Fall' is not quite the showcase it could be for her as it is largely filled with average goth rock and metal. But, then again, competition is tough in this genre. It's hard to do something truly novel and compelling no matter how good your vocalist is.